The Hayes Arboretum contains 466 acres of woods, fields, and streams that are made available to the public for educational and recreational activities. The Arboretum educational opportunities allow children and adults to learn more about the natural world right in their backyards. It has repurposed all of its buildings from pre-existing barns and buildings rather than building new ones. It has been open to the public since 1963 and has been offering educational class and camps since 1964. It has preserved not only land, but also a wealth of local history. 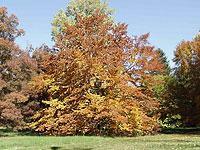 The Arboretum contains 3% of Indiana's old growth forests.